Uma Karuna Thurman was born to a Buddhist scholar, Robert Thurman, and a former model, Nena Thurman, in 1970. Even though she is an agnostic now, she had a Buddhist upbringing, and spent two years of her life in Almora, Uttarakhand. She battled with body dysmorphic disorder while growing up, but that didn't stop her from becoming a kickass actor. Her association with Quentin Tarantino began when she starred in his cult 1994 hit, Pulp Fiction. It was on the sets of this film that Thurman and Tarantino came up with the idea of the Bride, a character she would go on to play in another cult classic, Kill Bill, which was divided into two volumes. The Bride, AKA Black Mamba AKA Beatrice Kiddo, is still one of the most powerful female characters ever written. She doesn't hold up to conservative ideals of a "strong female character," and that is exactly why she is a feminist film-nerd's dream. Here are all the reasons Uma Thurman's Beatrix Kiddo is one of the most well-written, badass female characters in cinema. Ever. She is a complex human being. Beatrix is a fully-fleshed out, three-dimensional human being, and not just a straw character who can yield a sword. She is a hardened assassin, but that hasn't stopped her from being considerate towards children. She is just as capable of slicing a woman's brain open as she is of being maternal towards her own daughter. This slays the stereotype that mothers are only capable of nurturing. A woman can be a warrior, as well as a mother. She doesn't need a knight in shining armour. Strength is inherently perceived as a physical trait, and often thought of as masculine. Mental strength is just as important, but somehow female characters are generally shown to lack both. In the world of action films, whenever there is distress, women wait for their knights in shining armour to come save them. Beatrix Kiddo never looks to a man to overcome any obstacle, and displays an amazing amalgamation of both physical strength and a sharp presence of mind to get herself out of every situation. At times, she is emotionally, as well as physically, weak. Strong characters, traditionally, are not supposed to cry, or show weakness of any kind, be it emotional or physical. Beatrix Kiddo is emotional around her daughter. At times, her physical strength dwindles during her strenuous training under Master Pai Mei. Her portrayal of strength and weakness is completely human. She views her adversary as an equal. Beatrix finds out that Vernita Green, AKA Copperhead, a former member of the same Deadly Viper Assassination Squad that she was a part of, and who also had a part in her wedding massacre, is leading a domestic life and is mother to a four-year-old daughter. But that does not make Beatrix sympathise with her, nor does she consider her a lesser or weaker opponent. She sees her as a professional equal, and eventually kills her in a fair fight. She is flawed, but fair. Beatrix didn't want Vernita's daughter, Nikki, to watch her mother die. That in itself is an incredibly human act, defying the idea that kindness is a weakness in women. She gives Vernita the option of a midnight duel, but in a bid to save herself, Vernita shoots Beatrix right then. She misses, and Beatrix kills her with a knife, a scene that Nikki witnesses. Instead of killing Nikki, too, Beatrix apologises, and promises to be waiting for Nikki, should she choose to avenge her mother's death in the future. She knows how to be feminine when need be. In our patriarchal society, women are given a currency to bargain with - femininity. Women are criticised if they are too feminine, they are criticised if they are not feminine enough. Beatrix chooses to exploit this very social currency to get her way, much like the male characters exploit their masculinity to the same end. She tries to charm Hattori Hanzo at first to get one of his finest swords, and uses the same trick on Esteban Vihaio when she wants to find the whereabouts of Bill. But when she needs to talk business, she drops the act and gets the job done. Tarantino's Beatrix is just as bloody and fearsome as his men. Tarantino is famous for his gore and violence, and none of that is softened just because the central character is a women. A pregnant Beatrix Kiddo is introduced completely covered in blood, in her wedding dress, in the very first scene. That is the brilliant juxtaposition of violence against a conventional image of femininity. Moreover, her major opponents in the film are all capable, fearsome women, each deadlier than the other in their own ways. 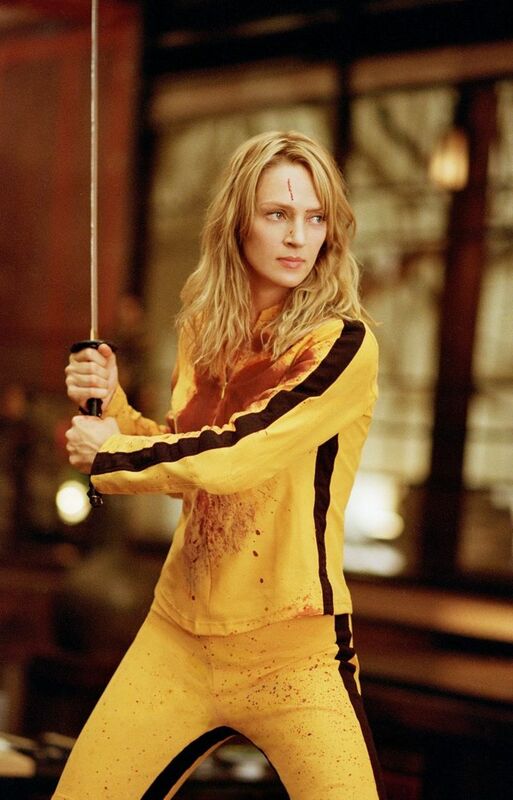 Uma Thurman's Beatrix Kiddo is a nightmare-inducing killing machine, who can give any male counterpart a run for his money and life, including the robotic Anton Chigurh (No Country For Old Men). Her bloody Bride broke every stereotype there is about what a strong female character should be like, and will always be the coolest, most badass assassin ever created in the history of cinema.